Fibro-osseous lesions are benign mesenchymal tumors in which mineralized tissue, blood vessels, and giant cells, in varying proportions, replace normal bone. Although this group of lesions includes reactive lesions, harmatomas, and neoplasms, they cannot be distinguished only on the basis of the histopathology which can only confirm their common fibro-osseous nature. Definitive diagnosis requires thorough radiological evaluation. Computed tomographic images of craniofacial fibrous dysplasia on bone windows may be helpful and allow precise pre-operative diagnosis and surgical planning. Fibro-osseous lesions are benign mesenchymal tumors in which mineralized tissue, blood vessels and giant cells, in varying proportions, replace normal bone. Normal bone and marrow are replaced by fibrous tissue and haphazardly distributed woven bone. These are congenital, non-hereditary skeletal disorders. In most of the lesions, the deformity in the jaws begins as a progressively slow-growing pain less swelling. Growth of the lesion often slows or becomes arrested at the onset of puberty, maxilla being predominantly affected with the female predilection. Craniofacial fibrous dysplasias (FD) comprise less than 1% of all primary bone lesions. 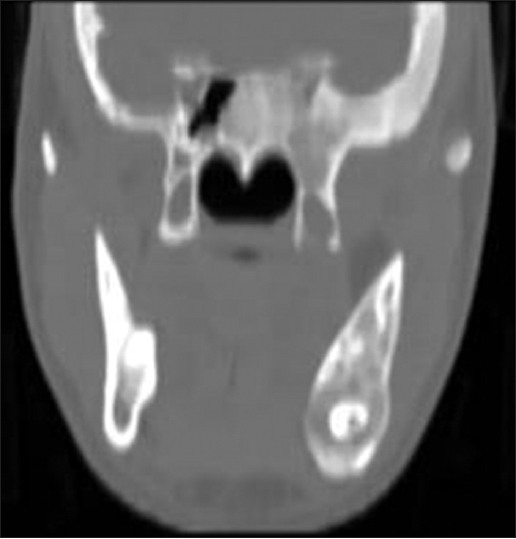 In this report, a rare case of FD with the extensive craniofacial involvement with the emphasis on computed tomographic (CT) features is presented. CT scan was extremely important to know the aggressive nature and thus, aid in its diagnosis as only jaw bone involvement was suspected on clinical examination. 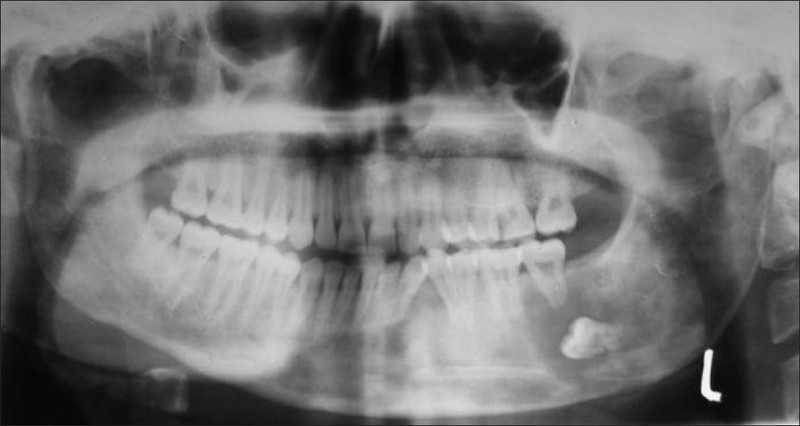 A 23-year-old Indian male reported with a complaint of gradually increasing painless swelling on the left side of the jaw for a year. The patient was born to parents with the consanguineous marriage. There was no history of similar complaint in other family members. Extra oral examination revealed a diffuse swelling on the left side of the lower jaw extending from midline to the angle of the mouth region approximately 3 cm × 3 cm in size. The skin over the swelling appeared to be normal. On palpation, the swelling was hard, painless with the gradually merging borders. Serum calcium, phosphorous, and alkaline phosphatase levels were within the normal range. Intraorally, a single, bony hard swelling in the labial vestibule (3 cm × 3 cm) was palpable. There was slight lingual expansion in the region of mandibular left canine. Distal tipping of mandibular left canine and lingual tipping of mandibular left first premolar was noticed. A thorough radiographic evaluation was carried out. Complete skeletal survey ruled out lesions except in the skull and facial bones. 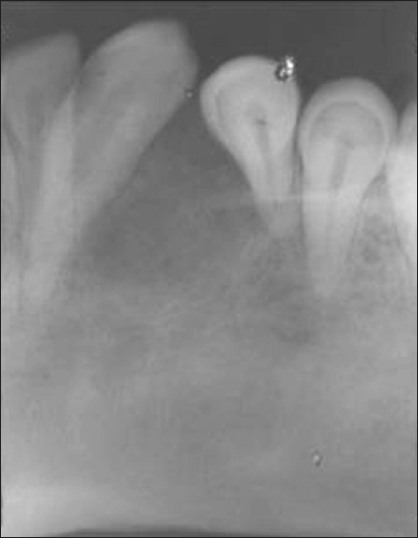 An intraoral periapical radiograph of mandibular left canine-premolar region [Figure 1] revealed gross displacement of roots of canine and first premolar. A mixed lesion with indistinct borders was noted. The trabeculae in the periapical region were more dense, irregularly shaped and numerous giving a ground glass appearance and an area of opacification without any definite borders. Orthopantomograph [Figure 2] showed a diffuse mixed lesion extending from the mandibular left canine region up to the ascending ramus and the coronoid process and the condyle on the left side, with expansion and thinning of inferior cortex and posterior border of the ramus. The mandibular left third molar is displaced inferiorly below the roots of the second molar. The coronal CT image [Figure 3] revealed expansile lesion with patchy areas of ground glass appearance and hypodense areas scattered throughout the mandible and the skull base involving the left middle cranial fossa, with a diffuse involvement of the entire mandible, orbital plate of the frontal bone, sphenoid bone, and squamous temporal bone on the left side. The axial CT image [Figure 4] demonstrated diffuse involvement of multiple bones like the lateral wall of the orbit, lesser and greater wings of the sphenoid bone, the squamous portion of the temporal bone and the sphenoid sinus. 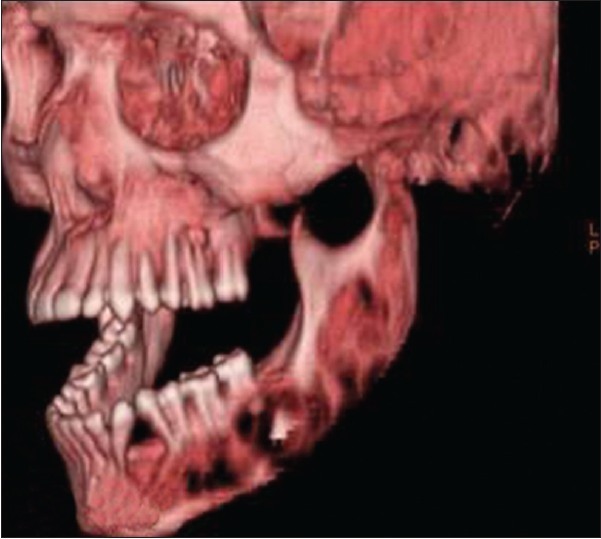 Three dimensional CT image [Figure 5] demonstrated gross extensive, destructive pathologic lesion involving the mandible, the maxilla and squamous temporal bone. Kaban have classified lesions of FD as quiescent, non-aggressive, and aggressive on the basis of clinical behavior and radiographic findings. The appearance of FD on plain radiographs depends on the activity of the tumor. In quiescent and non-aggressive lesions, the enlarged bone appears densely radiopaque or may have a "ground glass" appearance. Aggressive lesions demonstrate expansion of the bony contour along with cortical thinning or perforation. The teeth may get displaced and show root resorption. Lesions of the jaws are often poorly defined as compared to other long bones where they are circumscribed with a sclerotic periphery. On the basis of radiological findings of bony destruction of mandibular cortex with displacement of mandibular third molar and extensive erosion of several craniofacial bones, the present case falls in to the aggressive category. CT remains the "gold-standard" imaging modality for FD. As CT can be used to determine the extent, specific dimensions and radiodensity of FD with a high degree of precision and it would be valuable to be able to determine what are the long-term changes and which ones, if any, are associated with the continuous progression or reactivation. Hence, the CT findings in craniofacial FD prove to be an important aid in the diagnosis. 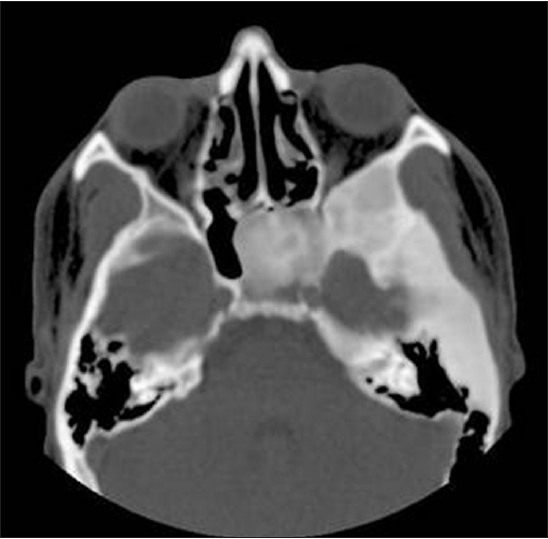 Based on the CT appearance, Paget's disease, hyperparathyroidism, neurofibromatosis, and chondromyxoid fibroma can be considered as differential diagnosis for craniofacial FD. Advances in the knowledge of the molecular basis of FD hopefully will lead to effective non-surgical treatments based on gene therapy in the future and imaging modalities like CT will definitely contribute for better understanding of craniofacial FD. Craniofacial FD is a rare entity. Radiological examination, especially, CT plays a significant role in the diagnosis of craniofacial FD. It helps us to identify the extent of the pathology, encroachment upon the vital structures, which will definitely aid in the treatment plan. 1. Lee JS, FitzGibbon EJ, Chen YR, Kim HJ, Lustig LR, Akintoye SO, et al. Clinical guidelines for the management of craniofacial fibrous dysplasia. Orphanet J Rare Dis 2012;7 Suppl 1:S2. 2. Papadaki ME, Troulis MJ, Kaban LB. Advances in diagnosis and management of fibro-osseous lesions. Oral Maxillofac Surg Clin North Am 2005;17:415-34. 3. Orhan K, Ýcen M, Paksoy CS, Arslan A, Oztas B. Fronto-orbital sphenoethmoidal fibrous dysplasia. Oral Radiol 2009;25:135-41. 4. Eversole LR, Sabes WR, Rovin S. Fibrous dysplasia: A nosologic problem in the diagnosis of fibro-osseous lesions of the jaws. J Oral Pathol 1972;1:189-220. 5. MacDonald-Jankowski D. Fibrous dysplasia in the jaws of a Hong-Kong population: Radiographic presentation and systematic review. Dentomaxillofac Radiol 1999;28:195-202. 6. Kaban LB. Aggressive jaw tumors in children. Oral Maxillofac Surg Clin North Am 1993;5:249-65. 7. Razek AA. Imaging appearance of bone tumors of the maxillofacial region. World J Radiol 2011;3:125-34. 8. MacDonald-Jankowski DS, Yeung R, Li TK, Lee KM. Computed tomography of fibrous dysplasia. Dentomaxillofac Radiol 2004;33:114-8. 9. Nager GT. Osteitisdeformans Paget. In: Pathology of the ear and temporal bone. Baltimore, Md: Williams and Wilkins; 1993. p. 1011-50. 10. Potts JT. Diseases of parathyroid gland and other hyper- and hypocalcemic disorders. Isselbacher KJ, Braunwald E, Wilson JD, et al., editors. Harrisons Principals of Internal Medicine. 13 th ed. New York: Mc Grow Hill; 1994. p. 2151-71. 11. Som PM, Curtin HD. Head and Neck Imaging. 4 th ed., Vol. 2. United States of America: Mosby; 2003. 12. Nezhad ST, Nooraie H, Arshadi C, Mohseni A, Dehghani F. Jaffe-Campanacci syndrome-Report of a case. Iran J Radiol 2003;1:63-6. 13. Yuen VH, Jordan DR, Jabi M, Agbi C. Aneurysmal bone cyst associated with fibrous dysplasia. Ophthal Plast Reconstr Surg 2002;18:471-4. 14. Malik R, Pandya VK, Awasthi P. Secondary aneurysmal bone cyst developing in fibrous dysplasia. Indian J Radiol Imaging 2006;16:1:27-8.